10in by 12in .025 metal with four 1/8in mounting holes and 1/4in rounded corners. 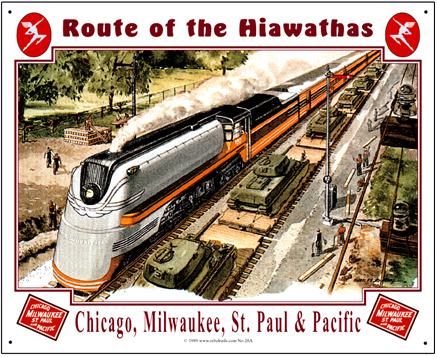 Beautiful tin sign of the Milwaukee Hiawatha passing wartime supplies bound for Europe in World War II. Americas Railroads were conveyor belts for war supplies and soldiers destined for overseas. Click on above image for zoom.